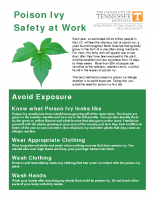 Here you can find downloadable posters, hazard signs, and even some legal posters such as the right-to-know poster. This is not an exhaustive collection and we add to it periodically. 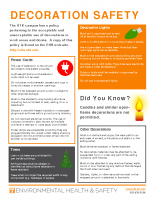 Here, you can find various downloadable posters, flyers, and short communications that you may wish to share with your colleagues, employees, students, or visitors. 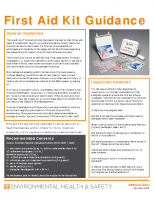 Please feel free to download and use them, but don’t hesitate to contact us if you need assistance or have questions. Several hazard signs are available below. Not all signs fit all situations. For advice on signage selection and signage design please consult EHS. We can help craft custom signs as needed. 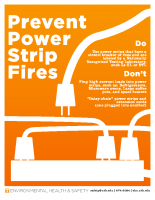 Danger signs indicate a hazardous situation which, if not avoided, will result in serious injury or death. Their use should be limited to the most extreme situations. 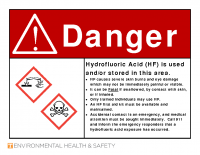 This sign is recommended for labs that possess or use Hydrofluoric Acid. 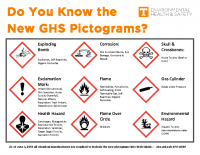 Warning signs indicate a hazardous situation which, if not avoided, could result in serious injury or death. 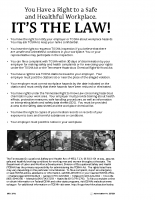 To be posted wherever welding operations are occurring. 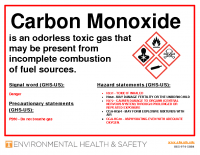 To be posted wherever carbon monoxide may be present such as around internal combustion engines indoors (e.g. forklifts). 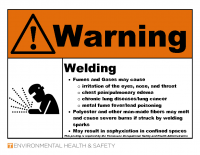 Caution signs indicate a hazardous situation which, if not avoided, could result in minor or moderate injury. 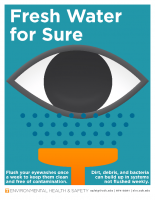 Notice signs indicate information considered important but not directly hazard related such as security or hygiene. 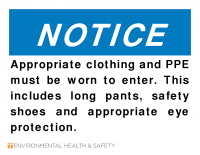 Use this sign for areas such as labs and shops where foot protection and eye protection is required to enter. 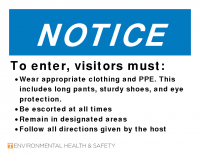 Use this sign for areas such as labs and shops frequented by visitors where clothing requirements and eye protection are required to enter. 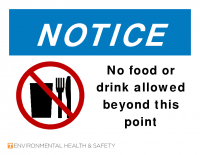 Use this sign for labs and shops to remind entrants that food and drink are prohibited. 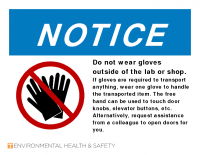 Use this sign to remind individuals to remove gloves before leaving the lab or shop or before touching “common touch surfaces”. 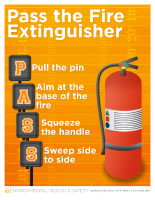 Safety Instruction signs are used to provide explanatory information like procedures and instructions. More definitive words can be used in this title panel such as “safe shutdown procedure” or “lockout/tagout procedure”.